Let's Just Build a House! : D. Lawless Hardware Winners! Last week on the blog we had our very first giveaway! It was fun to be able to give my readers a treat, and we even gained some new fans during the contest. Welcome! Congrats to Whitney @ Drab to Fab Design and Crystal @ Crystal's Musings! 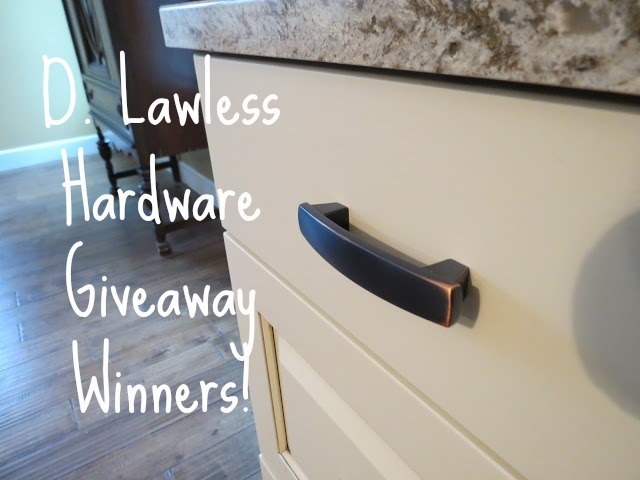 You each won a $50 gift card to D. Lawless Hardware! I can't wait to see what you guys pick out! Get in touch with me asap to claim your prize! Thanks to everyone for your entires...we will have more giveaways, and chances to win goodies later on down the road. And I still have a deal for our readers even if you didn't win... Get 10% off your order at dlawlesshardware.com! Come back and let me know what deals you get! I just sent you an email! I'm so excited! I never win anything. Hah! Yay!!! I'm so pumped!!! Thanks so much for hosting such a great giveaway!